By Jim Dower: IBF light heavyweight champion Artur Beterbiev (12-0, 12 KOs) plans on appealing the decision of the superior court in Quebec for his dispute with GYM promoter Yvon Michel, according to TVA Sports. The two-time Russian Olympian Beterbiev, 33, was hoping to have his promotional agreement with Michel end in a court case recently, but the judge ruled against him. It was concluded that Beterbiev’s contract is valid with GYM until 2021. Beterbiev will be appealing on Thursday. Beterbiev has been with Yvon Michel since he turned pro in 2013. His last fight was in 2017 when he beat Enrico Koelling by a 12th round knockout to win the vacant IBF light heavyweight title. That was Beterbiev’s only fight in 2017, and he still hasn’t fought in 2018. Half the year is gone and Beterbiev has been inactive, which is become the norm for him. ”Artur Beterbiev decided to appeal his case. The documents will be tabled tomorrow. On the side of Beterbiev, we do not think that a reconciliation is possible with GYM,” said Nancy Audet of TVA Sports. There are rumors that Beterbiev might retire if his court appeal goes against him. That would be a pity if Beterbiev does end his career because he still hasn’t had a big fight yet against any of the other champions. Michel hopes to keep promoting Beterbiev’s career. He’s expected to defend his International Boxing Federation 175 lb. title next against unbeaten knockout artist Callum Johnson next. That fight is expected to take place in the summer. Ideally, Beterbiev will fight at least two times in 2018. Whether that happens or not is unclear. If he spends time waiting on the appeal, it could limit his activity if he’s going to sit and wait on the outcome rather than getting back inside the ring as soon as possible. 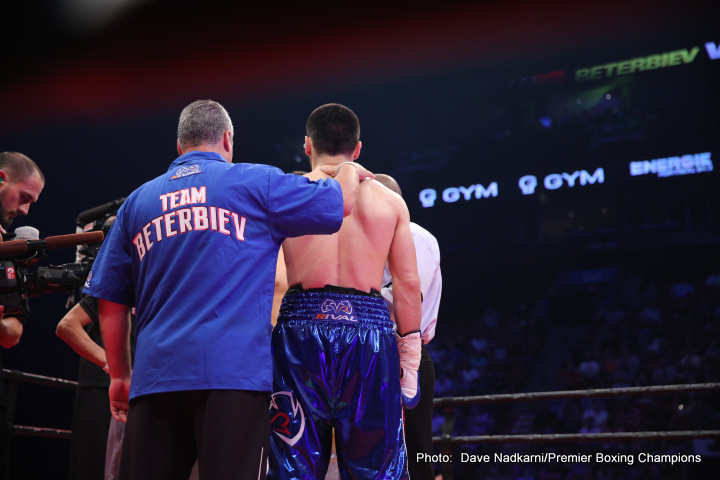 With the inactivity that Beterbiev has had in the last two years, he cannot afford to be sitting on the sidelines waiting for his appeal to be heard. He needs to get busy with his career, because his career has slowed down since 2016. Beterbiev got off to a late start with his pro career due to his long amateur career in Russia. There are rumors that Beterbiev could sign with Top Rank if he’s released from his promotional deal with Yvon Michel. Whether that would be a good career move for Beterbiev is unknown. Top Rank has unbeaten contender Oleksander Gvozdyk signed to their promotional stable, but he’s not a star and the chances are he’ll lose to WBC light heavyweight champion Adonis Stevenson when the time comes for him to get a title shot. Beterbiev vs. Gvozdyk would be a good fight, but nothing special. The boxing public would likely prefer to see Beterbiev face Stevenson, Badou Jack, Dmitry Bivol or Sergey Kovalev. Those guys are the major players in the 175lb division. Beterbiev is viewed as one of the most avoided fighters in the light heavyweight division today. It’s unfortunate that he rarely fights because he’s not able to take advantage of his talent by facing the better fighters in the 175lb weight class.